Learning an instrument takes time and patience. I mean let’s face it if was easy everyone would be doing it. There comes a time though, when you’re learning a tune and you just can’t quite grasp it. So what do you do? Quit, I say. 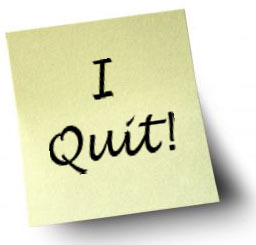 Just quit! Not forever of course. Only for the moment. Believe it or not, sometimes its better to walk away, put down your instrument, play another tune or just quit for the day. You’ll actually play it better tomorrow. There is a limited amount of space in the brain. Every experience you have during the day uses up this space, making it difficult to focus on one thing, like, say, the tune you’re trying to learn. During sleep, waves of electrical activity wash over your head, and over the course of the night the waves wash through the experience of the day, settling everything down. This allows your mind to rest and your head to be cleared so you can play better tomorrow. So if you’re having trouble with that one elusive note, or you just can’t quite grasp the rhythm of that tune, put it down and quit for the day. You’ll be better tomorrow. ‘Sleeping on it’ makes total sense. I’m a song guy, and someone once gave advice that when learning a new song, you should run through the lyrics in your head when going to bed…it helps burn the song into your brain overnight. That trick absolutely helps. If you’re having problems with a tune, perhaps lilting it to yourself while going to bed will do the same thing…then pick up the practicing later.